Status: Uncommon regular spring and fall migrant statewide. Locally uncommon regular resident east, extirpated west. Rare casual winter visitor statewide. Documentation: Specimens: UNSM ZM7696 (anatum) 14 May 1915 Garden Co; UNSM ZM7695 (tundrius) 5 May 1935 near Stapleton, Logan Co.
Taxonomy: There are 16-19 subspecies recognized world-wide, three of which occur in North America: tundrius, breeding from Alaska to Greenland, pealei from the Aleutians to southern Alaska and southwest Canada, and anatum, in North America south of the tundra to northern Mexico (Gill and Donsker 2017). Although earlier published information (Bruner et al 1904, Rapp et al 1958) suggested that only the widespread subspecies anatum has been found in Nebraska, the paler northern subspecies tundrius occurs also. There are three specimens of tundrius in the UNSM collection. An immature tundrius was in Phelps Co 2 Sep 2002, an emaciated tundrius was picked up and photographed in Buffalo Co 22 Jun 2013, and in the eastern Rainwater Basin tundrius is predominant in migration, with only two observations of anatum (Jorgensen 2012). Tundrius would be expected to occur in migration in Nebraska (Palmer 1988) and is the commonest of the subspecies occurring in Missouri during migration (Robbins 2018). The genetic heritage of captive stock used in introductions and now-established populations in Omaha, Douglas Co and Lincoln, Lancaster Co since the 1980s and 1990s respectively is uncertain, although wild birds which paired with reintroduced birds are thought to be of the subspecies anatum. Wheeler (2003) stated that introduced birds came from captive-raised anatum from the western US. The presence of an immature resembling the dark, heavily streaked west coast subspecies pealei in Dakota Co 15 Aug 2014 was thought by the observer to result from the reintroduction efforts in eastern North America. Resident: Resident birds in Nebraska descend from birds reintroduced to the Midwest, including from hacking efforts in Omaha during the 1980s. As of 2016, there are three known breeding locations. Efforts to establish breeding birds in Omaha began in 1988 when six young birds were hacked at the Woodmen Life Tower, 18th and Farnam (Cortelyou 1988). Two died, and the others departed in fall, the last bird in early Oct. The Mutual of Omaha building at 33rd and Farnam was also used as a hack site, but there had been no subsequent nesting activity there until 2017 (see Appendix A, Table 2). 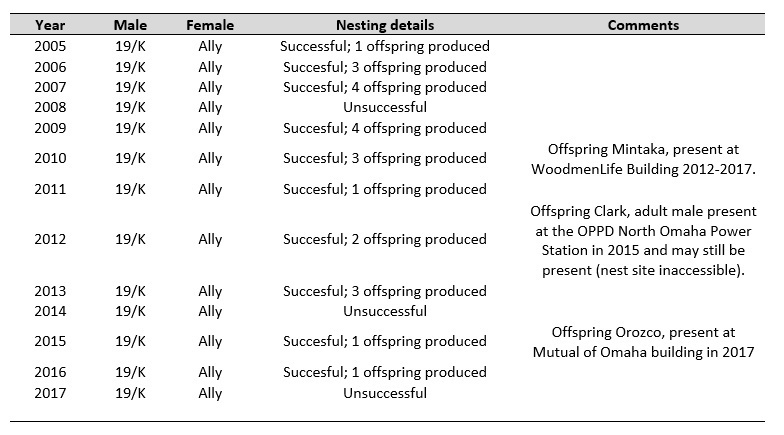 Apparently the first modern Nebraska nesting was at the Woodmen Life Tower in 1992, when a male from the 1988 release returned with a female which had been released in Des Moines, Iowa in 1991 (Morris 1992). This pair fledged three young that hatched 11-13 Jun. Nesting has taken place at the Woodmen Life Tower each year since, involving at least two successful pairings of a bird fledged in Omaha with birds released from other locations. See Appendix A for summaries of nesting at the Woodmen Life Tower. As Midwest Peregrine Falcon populations increased due to hacking efforts, birds eventually colonized the Nebraska State Capitol in Lincoln. 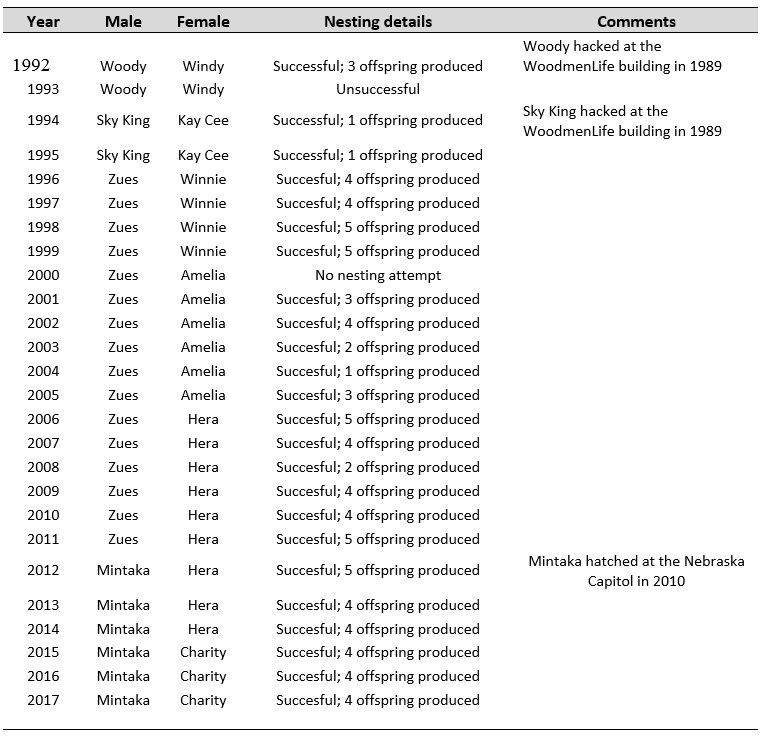 A banded male that had been released in Omaha in 1989 frequented the area in the summer of 1990; pairs were present most years through 2002, and in 2003 a pair of young birds began nesting in Apr. The female, only a yearling, fledged in Minneapolis in 2002 and the male, 19/K, in Des Moines in 2001. Two eggs were present 21 May, but they did not hatch. In 2005, a pair which included the same male, 19/K, and a female, Ally, hatched in Winnipeg, Manitoba in 2004, successfully fledged one bird. From 2005-2016, this same pair has nested each year and has fledged 26 young during this period despite varying success (NGPC, unpublished data). See Appendix A for a summary of nesting at the Nebraska State Capitol. In 2015, nesting was confirmed at the Omaha Public Power District’s north Omaha power station where a nest box had been placed on a smokestack several years before. Nesting also occurred at this location in 2016, and copulation was observed 17 Feb 2017. One was there 12 Apr 2018 but had been “hard to find this spring” (Jerry Toll, pers. comm.). The male of this pair, Clark, hatched at the Nebraska State Capitol in 2012. A third pair in Omaha nested at the Mutual of Omaha building in 2017. The male, Orozco, was hatched at the Nebraska State Capitol in 2015 and the female, Chayton, was hatched in Kansas City, Missouri, in 2014. The pair laid two eggs, which hatched, but the eyases died. Away from Omaha and Lincoln, two birds were apparently defending a cell tower in Norfolk, Madison Co against a Turkey Vulture 29 Apr 2016 and were still present there and at a similar nearby tower 11 May. No additional observations have been made to suggest nesting is occurring at this site (Scott Buss, personal communication). A nest box in Topeka, Kansas was occupied in spring 2011 by a pair of Nebraska State Capitol products, the first recorded away from Lincoln. The pair included Boreas, a male fledged in 2007, and Nemaha, a female fledged in 2009. Late dates above do not include reports from Douglas and Sarpy Cos since 1992 and Lancaster Co since 2003, when breeding birds became established and are resident. There are earlier reports 15 Mar 1983 Kearney Co and 19 Mar 2016 Buffalo Co, and later reports 3 Jun 2001 eastern Rainwater Basin (Jorgensen 2012) and 5 Jun 2005 Harvard WPA, Clay Co. Some early dates may refer to birds which wintered in or near Nebraska (Winter). High counts: 9 between the Rainwater Basin and Sarpy Co 24 Apr 1998, and 5 at Lake McConaughy, Keith Co 13 May 2004. There were totals of 25 statewide in 1999, 22 in 1997, and 21 in 1998. There are several summer reports not attributable to resident birds in Lancaster and Douglas Cos: 7 Jun 1922 Omaha, Douglas Co (specimen HMM 6275, measurements; Swenk, Notes After 1925), 11 Jun and 1 Jul-8 Aug 1980 Garden Co, 22 Jun 2013 photographed Buffalo Co, 23 Jun 2011 Lincoln Co, 26 Jun 1968 McPherson Co, 10 Jul 2003 Nance Co, 14 Jul 1963 Douglas-Sarpy Cos, 18 Jul 2001 juvenile Harlan Co, 20 Jul 1988 Lancaster Co, and 26 Jul 1970 Custer Co. These summer reports are probably of wandering immature non-breeders. Peak numbers occur late Sep-early Oct. There are nine additional Nov reports and several of birds lingering into Dec (see Winter). High counts: 5 at Lake McConaughy 12 Sep 2013, and 4 in Knox Co 8 Oct 2011. Winter: There are numerous reports in the period Dec-mid-Mar. Most are in Dec-Jan, with only one recent Feb report away from the putative range of Omaha and Lincoln resident breeders, 27 Feb 2016 Sherman Co. The winter foraging range of the species is unknown, although Palmer (1988) stated that resident birds loosely defend a hunting range that may consist of up to 40 square miles. A circular territory this size implies a foraging radius of 3-4 miles or a maximum distance of 6-8 miles from a nest site. Comments: This species underwent a severe population decline in North America due to pesticides beginning in the 1940s. By 1964 the population was much reduced, but after restrictions on the pesticide DDT in 1972 the population has recovered (White et al 2002). Reintroduction efforts have also assisted in increasing the population, particularly in mid-latitudes; most Nebraska reports are since 1980. Table 1. Yearly summary of adult and nesting activity at the WoodmenLife building in Omaha. Data from https://falcons.woodmenlife.org/family-tree.cfm. Table 2. Yearly summary of adult and nesting activity at the Nebraska Capitol in Lincoln. Information from the Nebraska Game and Parks Commission. Cortelyou, R.G. 1988. Peregrine Falcon project in Omaha. NBR 56: 81. Morris, R. 1992. Peregrine Falcon nesting success in Omaha, Nebraska. NBR 60: 71. White, C.M., N.J. Clum, T.J. Cade, and W.G. Hunt. 2002. Peregrine Falcon (Falco peregrinus), version 2.0. In The Birds of North America (A. F. Poole and F. B. Gill, Editors). Cornell Lab of Ornithology, Ithaca, New York, USA. https://doi.org/10.2173/bna.660.